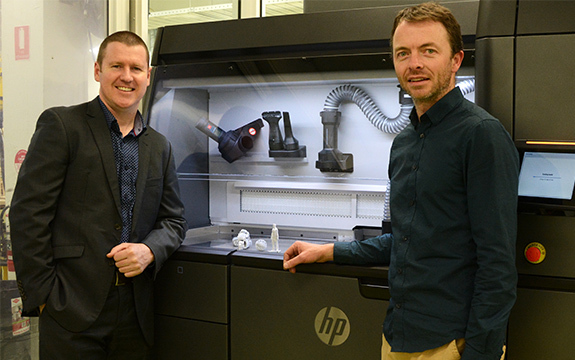 Swinburne has become the first Australian University to install the HP Jet Fusion 3D Printing Solution, the world’s first production-ready commercial 3D printing system that has also been adopted by global companies such as Nike and BMW. The new 3D printer, which has been installed at Swinburne’s Hawthorn campus, uses a multi-agent printing process, which is more efficient than the traditional 3D printing method of melting plastic. Workshop Manager in the Faculty of Health, Arts and Design at Swinburne Andrew Tarlinton said the new printer puts Swinburne students at a great advantage. “Having the ability to create parts that are essentially finished and ready to implement brings us in line with professional prototyping labs found in many large businesses,” he said. According to him, the HP Jet Fusion 3D Printing Solution allows for faster printing than previous models, without losing any detail or accuracy. “With the new technology we can produce prototypes at speed, while maintaining a high level of detail and accuracy,” Mr Tarlinton stated. Mr Stephen Nigro, President of HP’s 3D Printing Business, was adamant that the printer ‘is breaking new ground in manufacturing industry’. He said manufacturing companies, in-house model shops and 3D print service bureaus can print superior quality physical parts up to 10 times faster and at half the cost of current 3D print systems. “The new HP Jet Fusion 3D Printing Solution delivers a combination of speed, quality, and cost never before seen,” Mr Nigro explained. Mr Tarlinton said the new printer will enable students and staff to work with ‘more innovative and intricate designs’. “It will give us expanded capability to be able to print complex structures with stronger, thinner components,” he continued.